President Emmerson Mnangagwa canceled a scheduled appearance at the World Economic Forum in Davos, Switzerland, this week after rioting against his government that resulted in hundreds imprisoned and rumors of an impeachment attempt potentially organized by his own party. 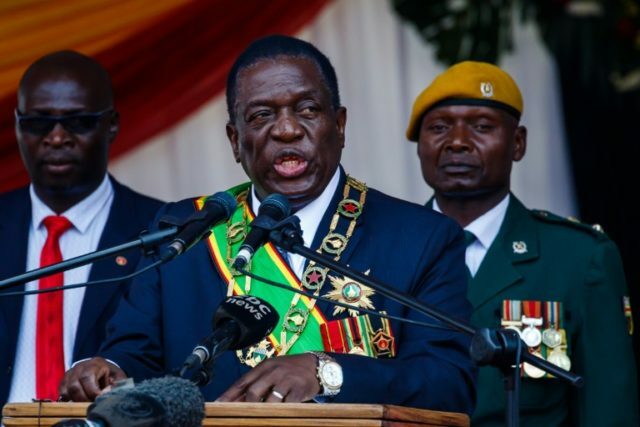 Protests erupted nationwide last week while Mnangagwa traveled to Russia and Central Asia seeking new financial opportunities and financing for the impoverished African nation, left destitute after decades of leftist tyranny under Mnangagwa’s predecessor Robert Mugabe. Before departing, Mnangagwa announced a severe fuel price increase, raising gasoline prices to over $12 a gallon and diesel fuel prices to $11.77 per gallon. These prices made Zimbabwe’s the world’s most expensive fuel. Churches, unions, and opposition party leaders called for a peaceful protest against the regime through three days of abstaining from participating in public life. In a note posted on Twitter, Mnangagwa announced he would skip the Davos summit and send his Minister of Finance Mthuli Ncube instead. Without providing any details on the protests, Mnangagwa stated that “the first priority is to get Zimbabwe calm, stable, and working again. The cancelation follows a week in which, from Moscow, Mnangagwa claimed that the protests “are almost fizzling out” and not a priority for him at the time. Since then, according to the regional newspaper New Zimbabwe, police have arrested over 600 people for alleged involvement in the protests and denied bail to 400 of those. Police insist that most of these are individuals charged with inciting violence, including some believed to be aligned with the ruling Zanu-PF party. Yet among the most prominent individuals arrested are opponents of the ruling party that had called for peaceful protests against Mnangagwa’s leadership, primarily in the form of a national walk-out from work and abstention from shopping or participating in community life. The arrest of Pastor Evan Mawarire, who used social media to urge opponents of the government to protest peacefully, has particularly outraged dissidents; Mawarire faces 20 years in prison, according to New Zimbabwe. The opposition Movement for a Democratic Change (MDC) party has accused the Zanu-PF of human rights violations including shooting live ammunition into crowds, killing and injuring protesters, going door-to-door seeking dissidents to beat and arrest, and shutting down internet access – targeting the use of social media like Whatsapp and Facebook to organize protests – making it harder for victims of police brutality to spread the word on these abuses. The MDC also reported a physical attack on their headquarters in Harare, the nation’s capital. Human rights advocates in the region claim that the number of people arrested may be higher than that known because of the lack of access to internet, including the arrests of minors who are illegally being treated as adults in the legal system for alleged affiliation with protesters. Among the few stories to surface on international media of government abuses is that of the family of Solomon Nyaruwa, killed last week while fleeing live fire from police. The family stated, according to New Zimbabwe, that the government had banned them from gathering for a funeral to mourn their relative, who was not a protester but happened to be near a gathering of protesters when he was shot. Nyaruwa reportedly died after being dragged into a jail cell after being shot and denied medical attention, as police fled a mob stoning by attacking protesters. “However, when we gathered to mourn him at his home in Yellow City, armed police and army officers came and told us not hold his funeral wake,” his brother told his church congregation. The Mnangagwa government has blamed protesters for the violence, claiming that rioters have burned down several Zanu-PF buildings and vehicles in Bulawayo in response to the violence from police, as well as attacking locals believed to support the party. When presented with evidence that individuals wearing military and police uniforms participated in much of the violence, mostly concentrated in Bulawayo and Harare, the government claimed that only former police or imposters wearing counterfeit uniforms were to blame. Mnangagwa will return to Zimbabwe not just to address the chaos on the streets but to quell rumors of a rebellion against him within Zanu-PF. While a lifetime member of the party, Mnangagwa was forced into exile for much of 2017 by Mugabe, who had appointed him vice president. Mnangagwa had run afoul of First Lady Grace Mugabe, who had openly stated her intention of succeeding her husband. With allies in the military, however, Mnangagwa staged a bloodless coup in November of that year and has remained in power. “As your impeachment looms, it is in your best interest that you accept it and contain your die-hard sycophants from engaging in conduct that will be attributed to you in both local courts and International courts of justice,” the statement, allegedly from Zhuwawo (who also served as Minister of Youth under Mugabe), read. By Monday, rumors of an impeachment plot against Mnangagwa began to circulate more aggressively but claiming that the impeachment would not happen because the organizers had failed to gather the legislative votes to make it happen. “The plot is foiled, they lack numbers for impeachment and the devil… ( is) amongst us,” Zanu-PF lawmaker Mayor Wadyajena said.